Time To Reassess Law For Young Violent Offenders? As a light mist falls, young singers practice outside St. Patrick’s Catholic Church in Kathleen, Georgia. 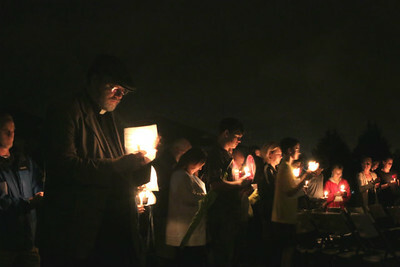 People begin to gather at a firepit for a candlelight vigil. They come to remember 16-year-old Ryan Skeen, shot dead in late October. But there's more to the community gathering. The one put away is 13-year-old Kaden Barefoot, who is accused of shooting Skeen. Barefoot faces murder charges in an adult court. That’s due to Georgia's so-called "seven deadly sins" law, which is shorthand for the seven charges that vault juveniles to adult court. More than 100 Georgia kids under the age of 18 are in adult prisons. Most, however, are not accused murderers. A third of them committed armed robbery, according to Department of Corrections figures. This tough-on-crime law dates back decades. It was the late 1980s when Aakeem Woodard and an accomplice held up a store as a 15-year-old. The clerk was shot and killed. He was arrested, charged as an adult for murder. “The next day, the magnitude of what I'd done ... hadn't even registered with me yet,” Woodard said from his home about 30 miles east of Atlanta. Woodard remembered how the court proceedings confused him. And how the adult prison experience hardened him. Woodard admits he's the rare juvenile who straightened out his life. He was released four years ago, works with young offenders and has a child of his own. There’s no telling what will happen to Kaden Barefoot or to teenagers arrested in Macon and Savannah for serious offenses that have landed them in adult court. The approach was meant to deal with kids who were becoming “super-predators.” Melissa Carter, who leads Emory University’s Child Law and Policy Center, says time has shown that young offenders can rehablitate. “If we dont have a class of kids who we're scared of, who are remorseless offenders. Then, in fact, what we have are individuals who are involved in acts that were, perhaps, intentional but need to be understood at an individual level,” Carter said. Carter said with a mentality of reform sweeping the Georgia statehouse, and the nation as a whole, now should be the time to revisit these get-tough on youthful offender laws. The Bibb County District Attorney David Cooke isn’t as sure. Cooke said the prosecutors could choose not to try juveniles in adult court. But he says most of the cases that come his way are “very cold-blooded situations.” Cooke is fine with looking at the disparity of juveniles in adult prison. Nearly nine out of 10 currently housed are African-American. “But as far as being tough on violent crime that endangers our families, we need to be smart about that and not throw out something that has made us safer,” Cooke said. At the candlelight vigil, Father Eric Filmer tries to help the assembled grapple with the death of Ryan Skeen. “We know that many things happen in this world that tell us it's not the way it's supposed to be,” Filmer said. While the four dozen or so people pray for the families of both the victim and the 13-year-old accused of murder, Ryan Skeen's friend, Frank Bulin, hesitates when it comes to leniency. Whether a second wave of juvenile justice reform happens will depend on legislative action next year.